Almost two decades ago Solnit saw that the efficiency-minded tech industry was framing the messiness of public life as comparatively inconvenient and inefficient, and that the sector thus played a key role in “accommodating spatial privatization and speeding up an economic privatization.” What results, she argues, is a Hollow City, one whose colorful Victorian homes and corporate workspaces mask its increasingly monochromatic populations and cultures. Paul Gillespie, a cab driver quoted in McClelland’s book, wonders: “If you are riding the Google bus, and you are looking on your cell phone for stories that are tailored just for you, and at night you are taking an Uber to a nightclub or restaurant with a lot of other people just like you, where is the interaction with everyone else? Where is the knowledge of what other people are thinking or what’s going on in the world?” Walker likewise acknowledges the tech industry’s role as global evangelist for the exploitative sharing economy, the Californian Ideology, and neoliberalism, and its failure to address privacy breaches and fake news and technological solutionism—all of which have shaped politics and economics around the globe. 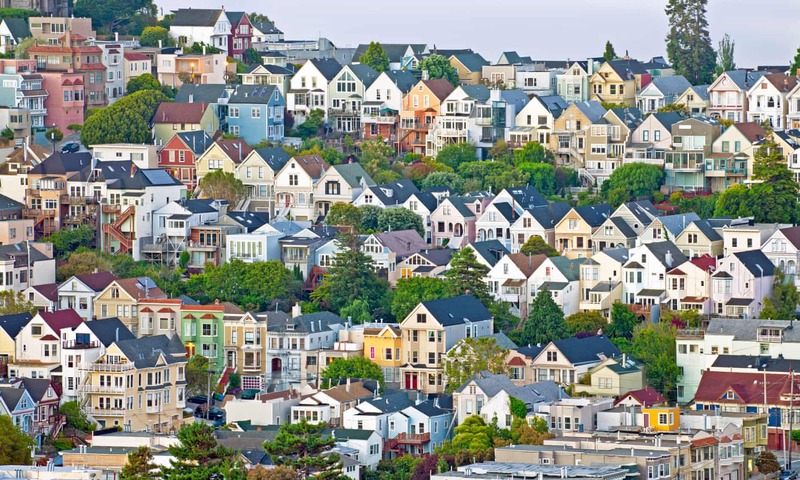 Image of San Francisco via The Guardian.